The matte finish feels really good. It's got some texture to it. That kind of texture makes it so you can get a good grip but you can still rotate the handle in your palm smoothly and without making your hands sore from the friction. The cool thing about it is it works well when your hands are sweaty too, and it holds chalk. Troy's kettlebells prior to 2017 had a glossy finish and smooth texture with occasional rough spots. 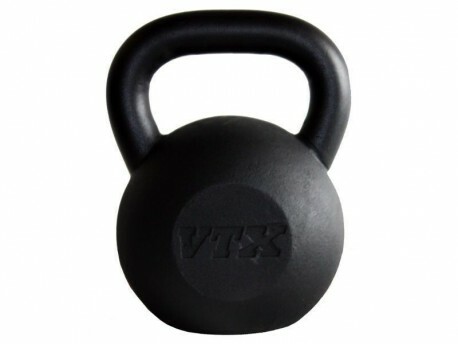 This is a huge improvement and comparable to the feel of any other top rated iron kettlebell out there. Sizes under 30 lb have a gradually smaller diameter handle, to stay somewhat proportional to the size of the body. So anyone with smaller hands will find them easy to get their hand around and get a secure grip. The 30 lb through 100 lb have a 35mm diameter handle, or about 1.38". This is thicker than Troy's previous model, which was 1.25". Some other models are 1.5", which is just too big to hold onto effectively. A kettlebell handle, because of the way you move it around, should be a little thicker than an Olympic bar, which is 28mm or sometimes up to 32mm for the thickest power bars (other than the specialized 2" fat bars you can also get). So that gives you an idea where this 35mm/1.38" handle compares to Olympic bars. Imagine trying to do cleans or snatches with a 38mm Olympic bar, and you can get an idea how easy thicker kettlebells could slip out of your hands when doing swings or snatches. The cast iron base is ground flat. The casting all over is nice and consistent, but it's good they paid special attention to this. Pounds marked on one side, and "VTX" on the other. The letters are all sunken into the flat face. The face has a flat area where the letters are.